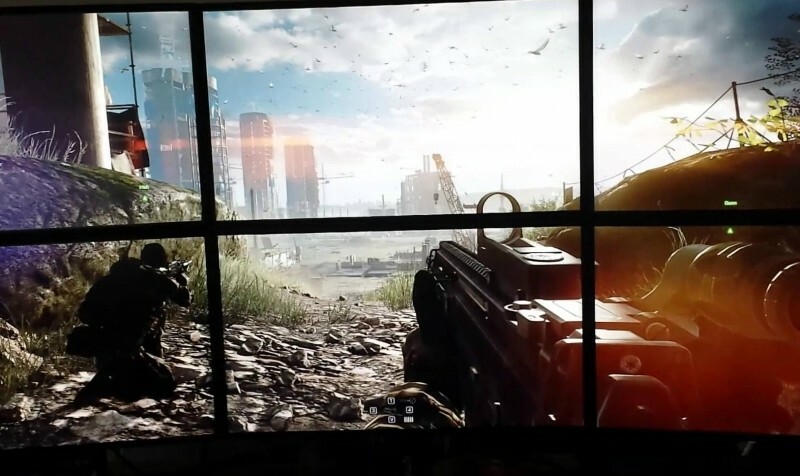 Multi-monitor, ultra wide or 4K: What delivers the best gaming experience? While 4K displays are obviously making huge waves for gaming on the PC, we’re also in an ecosystem where the possibilities for how we even display our games are better than they’ve ever been. 4K gaming as it stands still requires a tremendous amount of horsepower – two GeForce GTX 980s or an AMD Radeon R9 295X2 are basically required – but there are also other alternatives worth investigating. We have tremendous flexibility as far as aspect ratio, panel quality, and even add-ons like Gsync and FreeSync. If you want, you can even just stretch your game across multiple displays. I decided to investigate performance and the overall gaming experience on multiple different setups. To me, the four big options right now in terms of just aspect ratio are 16:9 (1080p or 2560x1440), multi-monitor surround, 21:9 ultra-wide, and 4K (technically 16:9, but different due to high pixel density). First, experientially, it’s basically a draw between 21:9 and 4K. My 21:9 experience is colored tremendously by the fact that we used a Samsung S34E790C, a 34” curved bear of a monitor that nonetheless offers almost all of the benefits of triple-monitor gaming with none of the drawbacks. My bottom line is if you want something immersive, one of the curved 34” displays running at 3440x1440 is going to give you the right mix of detail, picture quality, and overall field of view. Internally, we have people split between these two standards. A large 4K display offers something 21:9 displays currently can’t: substantially improved pixel density resulting in a much more detailed image. If raw detail is what you want and you’d rather stick with the conventional 16:9 aspect (and avoid any potential compatibility issues with wider aspects), then you should be shopping for a 4K panel. There is, however, another reason why 21:9 is picking up a bit of a following over 4K: 21:9 displays simply require less horsepower than 4K does. If you look at the number of pixels that have to be rendered at each step, a garden variety 2560x1080 display only requires about 33% more than a standard 1080p display does. Even the “deluxe” 34” 21:9 panel is still only about 2.4x the rendering, a far cry from the demands of 4K. So how does that translate to the gaming experience? Just a single GeForce GTX 980 is enough to keep framerates well over 40fps up to the 34” resolution of 3440x1440; things are exceptionally comfortable at 2560x1080, where you’d likely be fine with even a single 970 or R9 290. So if you’re not looking to break the bank on graphics hardware, you could arguably invest more in your display. Moving to a pair of GTX 980s, you’re now looking at essentially what I’d consider the bare minimum for comfortable gaming at 4K. Any other display setup runs beautifully on these two, but they should, since this is essentially the most performance you can buy before you start going into the truly treacherous waters of triple- and quadruple-card configurations. BioShock Infinite is always going to be an oddball with low minimum frames, but everything else is buttery smooth once you drop below 4K. From a practical perspective, a non-TN 4K panel is still going to cost you north of a grand, at which point you’re in the ballpark of these supersized 21:9 displays. Personally, I find the Samsung monitor infinitely more appealing than a TN-based 4K or any of the larger 4K displays, as it offers more immersion without going into the weeds the way triple-monitor surround can. Which direction would you go?